"Integrating Open Stack Swift with a Comprehensive EFSS solution"
OpenStack Swift is becoming the foremost deployed Private Cloud Storage solution in the world. But OpenStack can end up storing a lot of structured documents such as Word, Powerpoint, Excel, and PDF files. An enterprise grade EFSS solution can help fix complexities by providing audit, security, encryption, back-up and migration capabilities to the files shared in your organization. 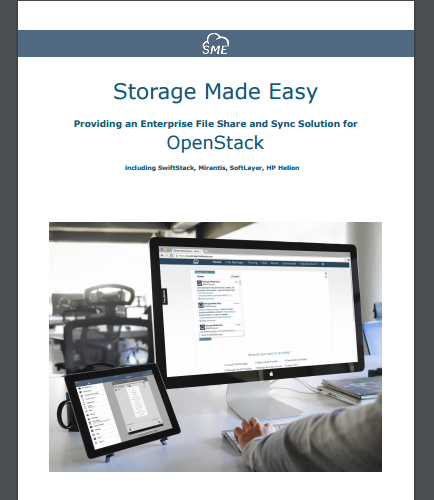 Read this whitepaper to know how you can get the below mentioned benefits by integrating OpenStack with a comprehensive Enterprise File Synchronization and Sharing (EFSS) solution. Search the contents of files stored on OpenStack. Unify OpenStack files and private data in a single interface for anywhere access. Easily annotate against PDF documents stored on OpenStack. Collaborative round trip creation and editing on documents stored on OpenStack. CloudEdit functionality to edit Documents directly on a user's desktop and save any changes back to OpenStack Swift. Create new or enhance existing dedicated OpenStack applications. Ceph is a free software storage platform designed to present object, block, and store files from a single distributed computer cluster. Ceph Object Storage is deployable in a fully scalable highly available architecture. But how can we extend the use of Ceph? This whitepaper will guide you in taking control of access to Ceph and explores topics like: Interacting easily with Ceph or share data using common protocols. CIFS Drive Access into Ceph from any desktop. Email integration with Ceph from Outlook/Mac Mail. Unifying Ceph files and private data. Search document content on files stored on Ceph. Enabling key data to be archived to Ceph easily. File sharing policies for Ceph. Enabling sensitive data to be encrypted with a private key prior to being stored on Ceph. What is Cloud software ? Cloud computing software generally fall under the Software-as-a-Service (SaaS) model. The software and the necessary infrastructure, used by cloud users, is provided and managed by the Cloud Service Providers (CSP). Cloud software includes fundamental business technologies like CRM, HRM, Sales Management etc. Examples: SAP SuccessFactors, Microsoft 365.